← Dillard’s AfroAmerican Arts Fest, a precursor to Jazz Fest? (Louisiana Weekly. April 2015). 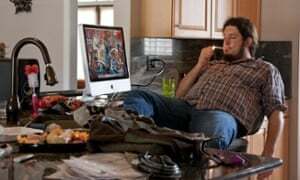 Mad Mike, the homeless blogger who became a millionaire overnight (The Guardian. March 2015). Missing the Austin ditch in which he’d slept most nights for the last two years, Mike Wille curled up on the front lawn of the large house his mother had just left him via her suicide note. Her death meant that Mike – known to fans of his street music and his homelessness blog, The Ground Score, as Mad Mike the Hippy Bum – would soon be a millionaire. Mad Mike worried that, given his love of drink and drugs, he could not survive such a lifestyle shift. At birth, Mike’s left leg was shorter than his right by an inch, with no defined calf muscle and an under-formed foot sans big toe. When I visited his mother’s former home near New Orleans recently, he showed me a box of family papers he’d unearthed regarding the lengthening of his leg by the famous doctor Gavriil Ilizarov, who invented the procedure. Still, the bum leg helped Mike nurture a negative outlook that, once he became teenager, fractured his relationship with his already volatile parents. “My mother was a fairly erratic person. Sometimes extremely benevolent and generous, other times scathingly cruel,” Mike told me. “When I was in the seventh grade, she tried to kill herself in front of me because I got a D in history and I said I didn’t care. Later we found her passed out in the garage with the car running and my dad freaked out, showing more emotion than I’d ever seen out of him. Immediately upon entering, one of the prisoners, a skinny guy about my age, walked up to me, looked me in the eyes, extended his hand, and in a welcoming voice said, “Hi. My name is “John.” Now I knew I was in luck. Not only had I stumbled upon a harmonious pod, but also one which contained at least one smart inmate. If you ever go to jail, I recommend doing just what he did, and greet any unfamiliar inmate coming into your living space in exactly this way (almost any). You can learn a lot from a guy by presenting him with the option of civility. I gave this gentlemen amongst the despondent a firm handshake and said, “Hey man. I’m Mike.” Over the next two nights I ate, slept, watched TV, read a book about Marlon Brando, and talked to John. A decent conversation is hard to find in jail, and I could tell he hadn’t had one in a while. As for me, it had probably been even longer. In this town, the only class of people less worthy of respect than prisoners, are the homeless. Thanks to his blog, Mike received fan mail from Scotland, New Zealand, Latvia and the Ukraine. To a homeless bum, this meant everything. Mike’s deceased mother’s house, a nicely appointed junior McMansion 45 minutes east of New Orleans, represents the first roof over Mike’s head in four years. Mad Mike spent the last 15 years blowing back and forth from Texas to his home state of Louisiana, surfing both couches and park benches. Highly intelligent, Mike could probably hold a job despite his handicap. He was not, however, what they call in New Orleans a “fauxbeaux”— one of those grungy traveler kids who begs for change even though they have a safety net. As a result, Mad Mike became a highly skilled scavenger. During an early trip to Houston, he found $700 atop a toilet paper dispenser in the bus stop bathroom.Another time he found what he estimated to be $500 worth of crack cocaine, which he intended to sell but instead smoked with his musical partner Ray Bongin a single evening. Soon after, he sniffed out a bottle of Dom Pérignon 2005 from behind a restaurant’s dumpster. His mother gave him his first laptop. They’d reconciled somewhat in the years since Mike’s 48-year-old oilman father died of cancer in 2001, leaving his mom a rich widow. She and Mike occasionally bonded by getting drunk together, but most of these hang sessions devolved into brutal, raging arguments. She gifted him the computer, unaware that any drug Mike found, whether or not he recognized the plant or powder, Mike would ingest and write about on his blog. Mike daily sat outside on the back steps of an Austin coffeeshop with Wi-Fi, blasting out touching and hilarious stories; as such, he possibly was the world’s first homeless blogger. His direct, pathos-driven diary entries smirked along with what most would consider an extremely rough life. Mad Mike’s economy of words and life of hardship even reminded some of Bukowski.